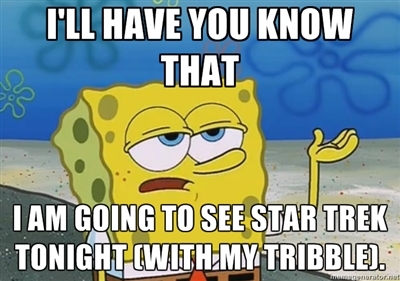 Captain: Should I go to the midnight showing of Star Trek? Captain: I can’t hang like I used to, but I want to be around real fans and they go to the midnight show. Java: Well, I’ve met this new guy and we’re going out of town this weekend. I have two passes to a screening tonight. Captain: That’s great about the new guy! Are you saying you’re not going to the screening? Java: Yes, I’m not. I’ve got to start getting ready for this trip. Do you want them? Java: Ok. Here’s the code. Captain: I just called to say I love you! Now, as you can see, there were a few problems with this conversation. We were halfway in before she mentioned having passes. lol. But, she came through and I was so stoked to go! Thanks, Java! So, on to the movie. I counted 18 black people and lots of other people of color (and a bunch of aliens)! Good job, J.J.! Not many speaking roles, but much better than the last movie and loads better than the previous movies. Captain’s Log: Wayment, how did I not see this coming?!? How did I never think of this? So, the latest rumor about Benedict Cumberbatch’s John Harrison is that he is actually Khaaaaaan! But, reading some of the reviews coming out, I am starting to think that he might actually be a Klingon augment! If you’ll remember the DS9 send-up to the Original Series, Trials and Tribble-ations, Worf was asked why Klingons in the Original Series didn’t have cranial ridges. He said they did not speak of it with outsiders. So, maybe, John Harrison is the beginning of the enmity between Klingons and the Federation? I’m not big time enough to get special screening tickets, but we will know if a few days! Can’t wait! EDIT: Well, that was fast. I just checked the IMDB page for the film. John Harrison is playing my favorite villain! I’m not sure what I just watched. So, anytime I mention the name, Benedict Cumberbatch, people say, “Daaaaamn!” It’s such an impressive name. You better be good at whatever you do with a name like that. The word on the street is that he’s just that, so I’m looking forward to seeing him in this film. Anyways, he debunked the rumor that he is going to play Khan in the May 17, 2013 film Star Trek Into the Darkness. I’m fine with that; I honestly don’t think anyone could deliver as iconic a performance as Ricardo Montalban did in the original. Cumberbatch will play a character named John Harrison, no backstory on the character yet. 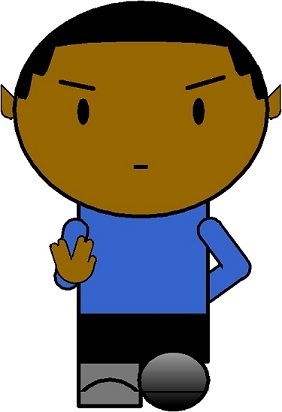 Update: There’s the scene in which Spock makes the vulcan salute to someone on the other side of a glass. This is an obvious sendup to Wrath of Khan, but I actually think that it is the villain on the other side of the glass. Whether Spock and the villain develop some sort of friendship during the movie or had some sort of prior relationship, I don’t know yet. We’ll see. Photo Credit: NY Daily News.